SimpleCert ceritficates of completion used by CPES courses. Congratulations to Philip I. Brilliant from the Continuing Professional Education Services, LLC (CPES) for being selected as the next SimpleCert Certificate of the month winner! 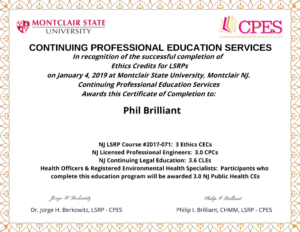 Continuing Professional Education Services, LLC (CPES) is a private company providing continuing education services to licensed and certified professionals in New Jersey and the surrounding region. Founders Dr. Jorge Berkowitz, LSRP and Philip Brilliant, CHMM, LSRP saw the need for a program offering continuing education courses for their own licenses. Developing CPES on the campus of Montclair State University fulfilled this need. Their programs have now spread to other university campuses in NJ. Industry experts and regulators from across the country teach CPES courses on site remediation, engineering and ethical matters. CPES uses SimpleCert to produce and distribute all of their Certificates of Completion to their students following their satisfactory attendance in their courses. CPES provides educational courses to the professional community who need to satisfy their obligations under State Licensing Programs. CPES is honored to be recognized by SimpleCert who makes it possible for Berkowitz and Brilliant to hold courses and provide appropriate documentation of completion. We proudly showcase the Continuing Professional Education Services, LLC (CPES) certificate of completion template as the winner of the Certificate of the Month Program for January 2019. By being selected as a certificate of the month winner, Mr. Brilliant will receive 250 SimpleCert credits in his account. Thank you, Mr. Brilliant, for utilizing SimpleCert as your Certificate Management System, and for being a valued member of the SimpleCert community!